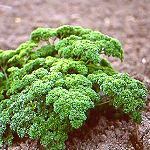 Parsley has been cultivated since the Antiquity. Originating in the Mediterranean area, it is now grown worldwide. 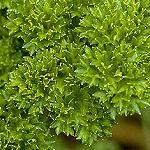 The characteristic, volatile parsley flavour is mainly due to the unusual terpene 1,3,8-menthatriene . Etymology: Lat. petroselinum, from Gr. petros, stone or rock, and Gr. 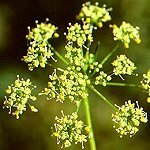 selinon, celery - that is 'a celery growing on stony ground' (the word celery is not to be taken too literally, probably it was used for several aromatic umbellifers). However, petroselinum might also reflect its former use against bladder stones, because of its diuretic properties. Lat. crispum, with curled leaves. 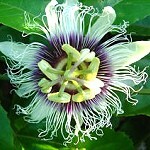 The genus Passiflora includes around 500 species, most of them from tropical and subtropical America. 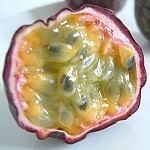 Many are grown for their edible fruits. The one most common to Europeans, P. edulis f. purpurea (photos) from southern Brazil, is sometimes called purple grenadil. Upon ripening, the fruit gets a dented appearance and develops a powerful 'exotic' or 'tropical' flavour from the juicy seed caps. Enjoyed with vanilla ice cream, for example, it makes a delicacy. P. edulis f. flavicarpa, for example, two cyclic compounds have been identified: 2-methyl-4-propyl-1,3-oxathiane  (which is now marketed by Firmenich under the name Oxane ®) and 3-propyl-gamma-sultine, the trans-isomer of which is claimed to possess a 'green minty' odor in high dilution . Etymology: Passion, from Lat. pati, suffering. A Spanish amateur botanist and missionary, Jacomio Boscio, recognised several attributes from the sufferings of Christ in the details of the very peculiar flower of this plant. Patchouli oil is obtained by steam distillation or CO2-extraction of the dried leaves of Pogostemon cablin, a small, tropical bush of the Labiatae family. It is a reddish-brown, viscous oil with a heavy, rich and truly unique, sweetish camphoraceous rooty-earthy-woody odour. You will always recognize the smell of patchouli! Long before Antiquity patchouli was brought to the Middle East along the silk route from the Far East. The silk fabrics had patchouli leaves enclosed to protect them from moths. 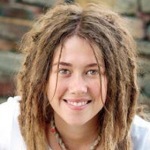 Patchouli oil underwent a surge in popularity in the 1960s and 1970s among the hippies and was intimately associated with the Hare Krishna movement, dreadlocks, etc. Patchouli is mostly grown in Indonesia. The yield of oil from the dried leaves is about 2 %. The world production is estimated to be more than 500 t/y. A small number of companies have specialized in the manufacture of refined qualities of patchouli oil for the perfume industry, where it finds extensive use in modern high-class perfumes. There are no synthetic equivalents of patchouli oil. 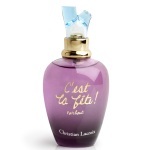 One of countless perfumes utilizing patchouli is C'est la fête Patchouli (Christian Lacroix 2008). The main constituent of patchouli oil is (-)-patchoulol (30-40 %). However, it is maintained that norpatchoulenol, present at only 0.3-0.4 %, is playing a principal part in the overall odour picture. The chemical structure of patchoulol was elucidated in 1963 by X-ray crystallography on its bright red chromic acid ester . Etymology: Gr. pogon, beard, and stemon, stamen, the stamens of the small flowers are hairy. Tamilian pach, green, and ilai, leaf. 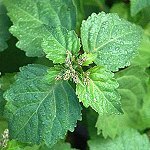 Aspects of the patchouli scent are present in a number of compounds, one remarkable example being ethylfenchol (available from Bedoukian Research, Inc.) having an extremely powerful and diffusive earthy odour, also reminiscent of geosmin. 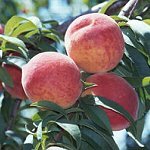 The special flavour of the ripe peach is mainly due to lactones, especially gamma- and delta-decalactone. 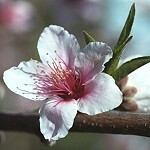 They are also present in apricot, Prunus armeniaca, and nectarine, Prunus persica var. nucipersica. The skin of ripe nectarines smells powerfully of these lactones. The lactonic flavour develops in the picked fruits or the fruits fallen to the ground. As long as the fruits are 'alive' on the trees, their aroma is much weaker and has another chemical profile  . Etymology: In spite of its Latin name, the peach originates in China. C-number whereas the odour of the higher gamma-lactones, gamma-dodecalactone for example, is very powerful. A remarkable transition in the odour character of the gamma-lactones takes place with increasing length of the carbon side-chain. 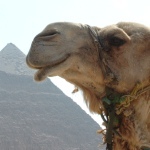 Gamma-hexalactone for example has an intensely sweet-herbal, coumarinic odour. When the C-number is increased, the odour becomes more fatty and coconut-like, but then suddenly changes into a decidedly peach-like odour from C-10 onwards. Gamma-lactones, delta-lactones (for example, see jasmine and coconut) and macrocyclic lactones (for example, see angelica) are very important aroma-compounds. They are of great importance in perfumery too. Already in the first century A.D. the Romans had 36 varieties of pears! Some fruits owe their special aroma to a few specific odorants. The characteristic pear aroma, especially present in sorts like Bartlett and Williams, is mainly due to the aliphatic ester ethyl 2(E),4(Z)-decadienoate . 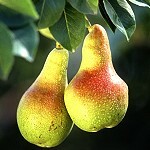 Pear nuances have recently become popular in feminine perfumes, playing sensually together with musky notes. 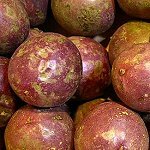 A number of substitutes for the natural pear ester have been developed, being more easily available. For example, methyl 4(E),7-octadienoate or Anapear ® is used in Emporio Armani Elle (Armani 1998) . Another fine pear odorant, 3(Z)-octenyl propionate, is marketed by Bedoukian Research Inc. under the name of Pearlate ®.